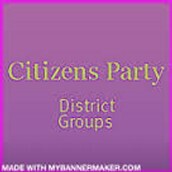 he Citizens Party seeks to increase the number of people engaged in the American political process. We strive to set aside the partisanship and ideological labeling that are corrupting the American political process and constraining real problem solving. e need to design a party logo before we can completely finish our new websites. We have several talented individuals willing to work on a design after the party gives them more feedback. The logo will be on our new websites and all party materials. If you have suggestions, please post them in the comments below.